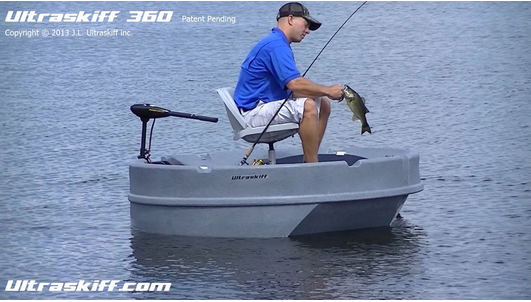 An alternative to a kayak/SUP (Stand Up Paddle) rigs for fishing, the Ultraskiff 360 is a task specific watercraft. 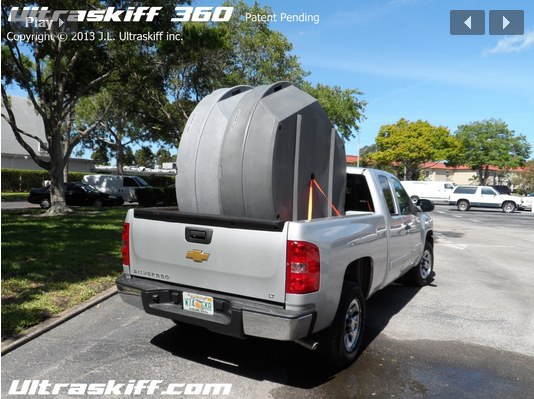 Ultraskiff is the brainchild of Jeff Lizzio out of Dunedin Florida, a 6ft diameter floating platform made of plastic with some well thought out storage. The center mast accommodates a fishing seat that is interchangeable. Simply looking at the design, it is easy to imagine that the Ultraskiff is a fine platform for fishing. Stable and open, all it needs is a canopy top to complete the ensemble, but with its high profile side and limited accommodations for propulsion, this thing could easily get away from you if the wind picked up, and a canopy top would only make matters worse. The company is just getting started so no pricing is readily available, but in an online statement from the inventor said he was looking to make something in the $1200 range. Color me intrigued to try one out, but a good fishing kayak rigged with a trolling motor is still probably a more utilitarian approach. You won't be taking an Ultraskiff down any Class 3 rivers but, to be fair, that's not its purpose. Loading and unloading a 123lb plastic tub cannot be easy even from the back of a truck but I like the fact you can fit two in a standard bed. The best of luck to Mr. Lizzio on his product launch!